Japanese circa 1900 pair of cloisonne vases. 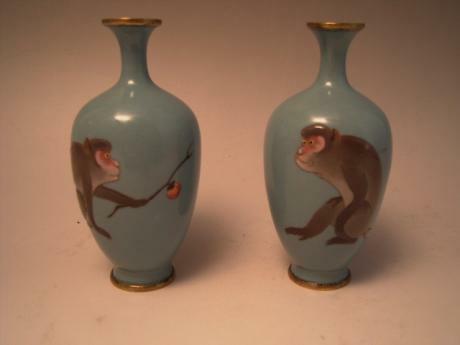 The pair has the design of 2 monkeys, 1 offering a persimmon to the other one, with 1 monkey being depicted on each vase done in MORIAGE raised enamels. The background is a grayish powder blue color. Each vase measures 4 3/4" tall and 2 1/4" wide at .. 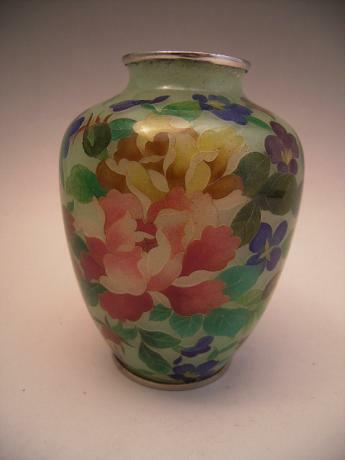 Early 20th Century Japanese cloisonne vase by INABA. INABA mark on bottom of vase and on bottom silver rim. Silver wires and rims. Finely detailed design of birds and chrysanthemums. Comes with box. Also stamped "Made in Japan" on bottom rim. 9 3/4" height by 6 1/2" diameter. 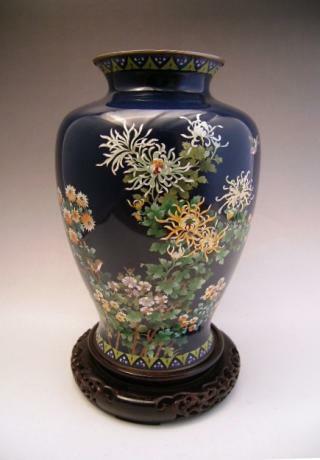 Japanese mid 20th century ANDO company cloisonne vase. Beautiful yellow and brown leaves against red background. Silver colored rim on bottom and top. "Cloisonne" is stamped on the bottom rim. The vase measures 10" tall and 5" in diameter at the top. 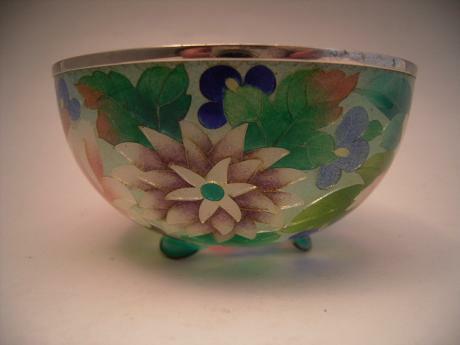 Early 20th Century Plique a Jour cloisonne footed bowl. Design is of flower blossoms and leaves. 2 1/4" height by 4 1/4" diameter. 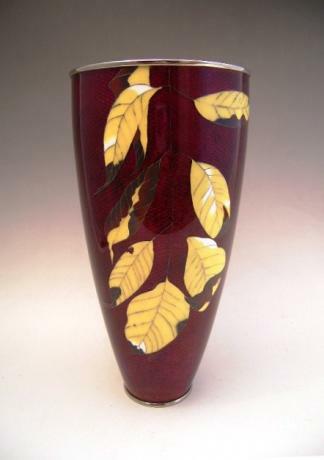 Early 20th Century Plique a Jour Cloisonne vase. Design is of blossoms, buds and leaves beautifully done in the translucent, Plique a Jour cloisonne technique. 4 3/4" height by 3 1/2" diameter.